Illnesses and injuries are perceived not only via their symptoms and impact but also via the products used to combat them. In the case of amputations, these products are prostheses. Prostheses are part of a medical treatment in product form, a fact which seems – judging by their responses to an everyday life they have yet to comprehend – to fill designers with a sense of either grand importance or grave humility. The model for prosthetic treatment of amputees is usually the undamaged and complete human form. Consequently, prostheses aim to imitate the lost body part as faithfully as possible. The techniques used in such attempts are old. 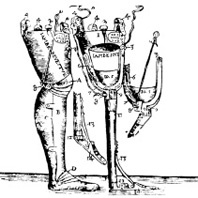 The principle types of prosthetic leg have long been the shell and tubular skeleton forms. Over the course of medical history, the materials used have evolved (from wood, leather and steel to aluminium plastics, fibreglass and carbon fibre), but even today, the character of the original designs is recognizable. The notion of imitative or masking prosthetics holds the promise of regaining a “normal” appearance. Although prosthetic treatment has long since become reality in a wide range of contexts, the self-image of human beings has not developed accordingly. Medical, prosthetic and – in future – nanotechnological interventions take place out of sight, sometimes concealed by clothing, sometimes by the skin itself. Although this invisibility of progress appears to keep the treatment a secret and allay the fear of discovery, the resulting peace of mind is fragile, often accompanied by a feeling of uneasiness over the non-visibility of the technical solution. Every human being has an image or idea of him/herself and his/her body. This inner image may or may not correspond to the body in question. I count among my friends a full-figured women whose inner image of her body is as large as her body itself. In other words: she is capable of animating every gram of her body. That is the stuff beauty is made of. If the beauty industry’s insidious appeals to a slimmer self-image were to hit home with her, she would start to feel alienated from her own limbs, notice a difference between image and body, and hence become “overweight”. Of course, in the interest of maximum turnover, these commercial appeals to the inner image refer not only to corpulence, but to the body as a whole, to its outlines and its surface. The loss of a body part forces the person in question to come to terms with a radically altered physique. What can be said about the updated self-image this involves? For one thing, the paths to physical and mental healing are as varied as the personal dispositions of patients. But it also depends on the offers made to those concerned. If the proposition is to conceal physical difference with an imitation, this also means that the “old” body image remains intact for outsiders (and for oneself? ), even though it no longer corresponds with the physical reality. In this case, a coming to terms with the altered body takes place either not at all or in private. Younger and mostly more active-minded amputees choose a different approach. They do not hide themselves or the difference fate has imposed on them. They upset the more simple-minded characters of those who stand and stare, claiming respect for themselves the way they are. There is a subtle difference between loudly displaying one’s difference and the quieter, energy-saving option of no longer hiding it. But the quiet always follows the loud. Only as a consequence of mental upheaval does something that has long been quiet become loud. A real limb must only function aesthetically in the context of the body as a whole. When separated from the body, it belongs to the realm of horror. An arm, leg or head without a body is shocking. A prosthesis must function aesthetically both in the context of the body and in its own right. Situations frequently arise at home or, for example, at the swimming pool, where a prosthesis is seen without its wearer. In such situations, a prosthesis that imitates the body part in question would be disconcerting in a similar way to a severed limb. A prosthesis takes the place of a missing body part. It therefore relates not only to the body of the patient, but also to the part that is no longer present, to something invisible. What does this mean for prosthesis design? If a prosthetic leg has protrusions, they are easily associated with bumps on a leg (ouch!) or with some kind of spot. Cracks or scratches on a prosthesis might conjure up images of a wounded limb. A successful design must do justice both to the (now) absent body part and to the present requirements in terms of form and function. The human body is made to walk forwards, forwards into an uncertain and dangerous world. In normal position, the sense organs all face forward. In the same way, the arms’ scope of action is essentially in front of the body. Sensitive parts (blood vessels, key bundles of nerves) tend to be located at inward-facing and rear regions of the body (the inner side of the upper arm, for example, is the place for the more sensitive and vulnerable parts of the arm, with the outward-facing part consisting mainly of more solid muscles and bones). Prostheses are meant to support, strengthen and protect the person in question. Prostheses, too, must be suited for entering uncertain territory. To move forward, one needs protection against collisions (both real and figurative). Finally, the concept of the “natural body” can no longer be defined. Is the natural body free of prostheses, of vaccinations, of physical training? At best, it is cultural consensus that decides whether a body or body part is considered natural or artificial. Culture is capable of rendering anything ordinary, from the most terrible to the most beautiful. This is one of the key tasks of design in medical technology. Besides (hopefully) being capable of increasing the practical value of prostheses or medical products in everyday use, the task of design to say something about the person in question. 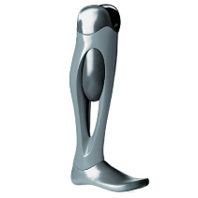 A prosthesis is a functional memorial to a body part. It is a tool which, whether intentionally or not, always makes a (technical, medical or cultural) statement about a person. The design of prostheses moderates this statement. In aesthetic terms, an artificial heart that looked like the insides of a clock would suggest that its user was a machine. One might object that an artificial heart can only be seen on an x-ray image – but before an operation, the patient sees what is to be added to his/her body. And after the operation, this is what s/he thinks about. And what s/he sees will influence the degree of his/her uneasiness or courage. The example of glasses, now considered harmless, illustrates the successful evolution of a medical product from a necessary evil to a universally accepted fashion accessory. Does a short-sighted person who has to wear glasses due to this disability still count today as disabled in the sense of an object of mockery or pity? The design of medical products can give people strength, strength in the face of other people’s stares and strength in their own self-image. It can uphold an obsolete image of body and self, or it can point the way towards a new sense of self-confidence. Consequently, the question in the 21st century is not how prostheses are provided to imitate the “natural” body, but how the “cultural” body manages to successfully integrate them.